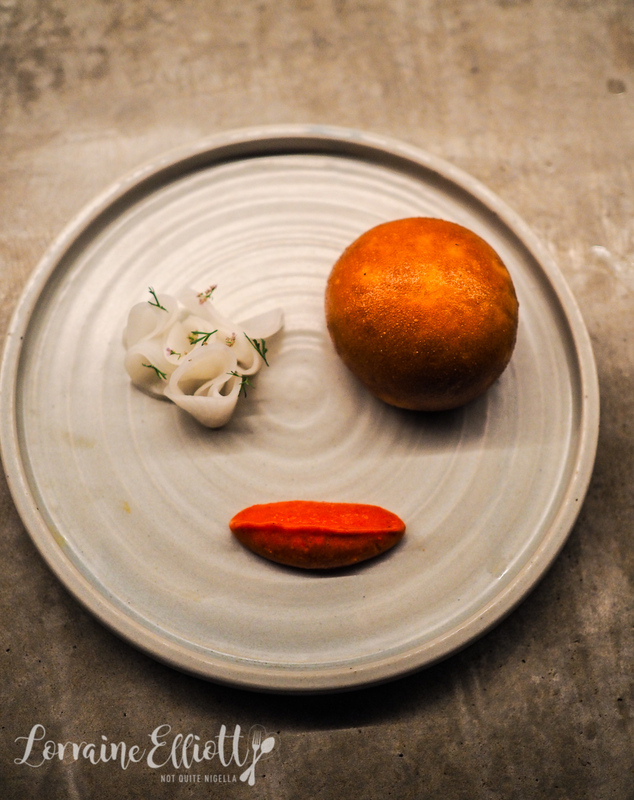 Sunda: A Seat At Melbourne's Best New Restaurant? 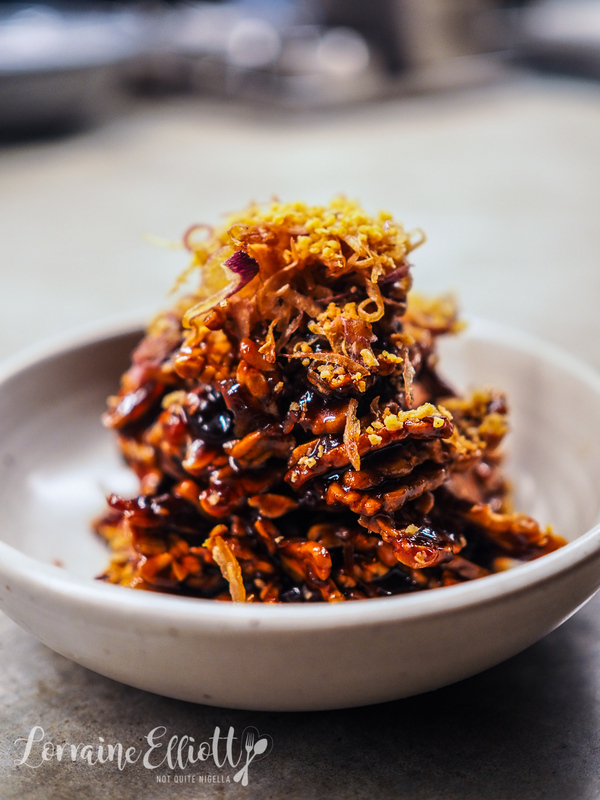 Sunda is an intriguing restaurant slightly hidden away on Punch Lane on the edge of Melbourne's Chinatown area. It is named after the Sunda region incorporating Indonesia, Malaysia and Vietnam. 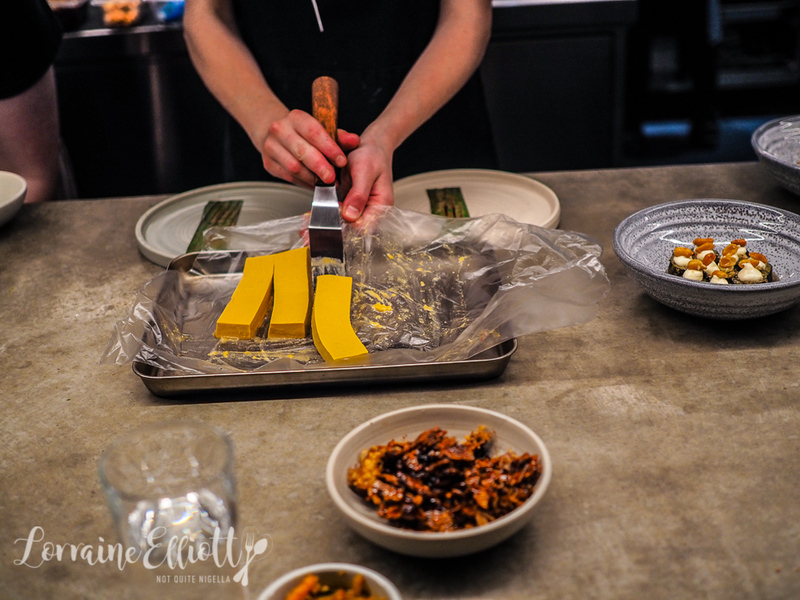 The menu is an intriguing mix of these three cuisines crossed with native Australian ingredients-think buttermilk roti with Vegemite curry topped with shaved Tasmanian truffles or an unforgettable Bika Ambon honeycomb cake. There isn't anything really like Sunda in Sydney which is my prerequisite when choosing restaurants in Melbourne. Knowing this, my food writer friend Sofia suggested that we dine at Sunda. Chef Khanh Nguyen (formerly of Mr Wong, Bentley Restaurant & Bar, Yellow and Cirrus) hails from the inner west in Sydney and moved to Melbourne in December 2017. Sunda is also Khanh's first venture by himself. "I didn’t like that people saw Vietnamese food as a cheap cuisine. As with other cuisines, Vietnamese food is just as time consuming with so many techniques to produce the dishes that make it what it is. I felt like I would be restricting myself if I were to open a Vietnamese restaurant and cooking Vietnamese food alone. From there I decided to cook south east Asian food, which became my new goal. 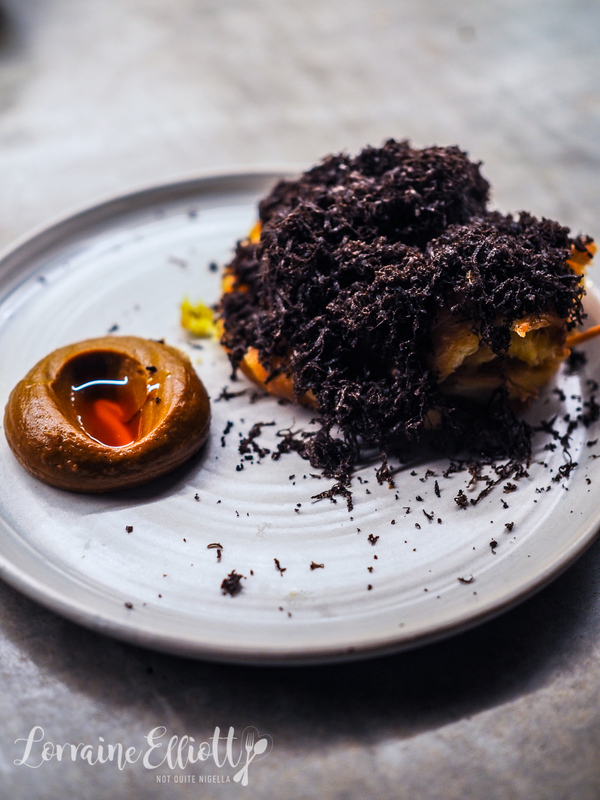 The flavours are somewhat familiar to what you would find in south east Asia but by combining it with native ingredients it creates something quite unique," he says. The simple glass box dining room is made up of bar seats as well as two long share tables. Bar seating allows you to watch the chefs in action and is where we take a seat. They bring us a tasty Achar (pickled vegetables) with dried soybeans and kohlrabi to snack on. A day earlier Sofia tagged me on an Instagram post of Khanh's letting me know that we would be dining on the final night that they had Tasmanian truffles on their menu. 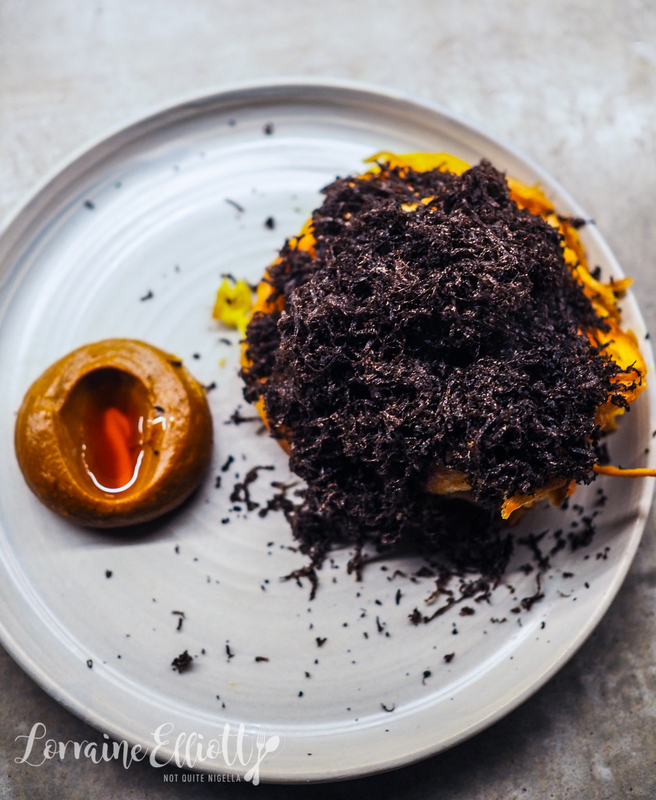 I almost feel that truffles are the universe's way of making you thankful for winter and at Sunda they're generously grated over a crispy, buttery, buttermilk roti served with a round of Vegemite curry. If this isn't a dish to suggest that multiculturalism works I don't what is. The vegemite curry roti dish is the result of several weeks of testing. There were versions of the dish using a wattleseed dough, a version cooked in lemon myrtle oil and one with a Davidson plum sauce. 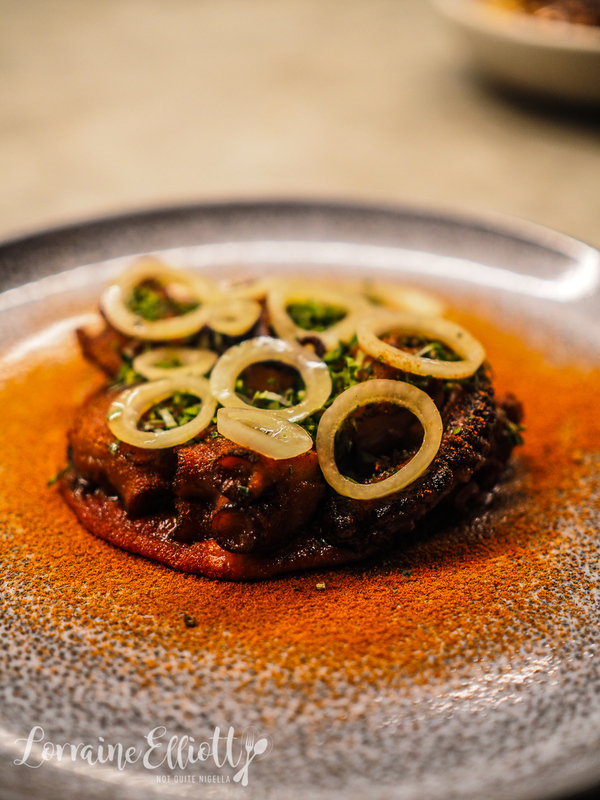 But it wasn't until one of his chefs made a simple roti at home and told him that it was better than the ones that he was making that he pared it back, "Sometimes you just shouldn’t try to much with adjusting a traditional dish," he says. They replaced the milk with buttermilk, used cultured butter, condensed milk and layered the dough with brown butter and made the roti what it is today. It is a lengthy process which is why it is an off menu item and they only serve 20-25 daily. And the Vegemite curry? "The vegemite component is made from the usual ingredients you’d find in a curry with added butter, roasted yeast, vegemite and sour cream. That little dip has around 35 ingredients, giving it a unique and complex flavour," explains Khanh. And it is amazing. Even tempeh, an oft derided vegetarian or vegan ingredient becomes a thing of tastiness with a rich palm sugar and tamarind sauce with fried ginger flower on top. It's like a tasty chip dipped in a sweet, tangy sauce. We watch as they fry the wagyu rendang bun. The wagyu is soft and not as spiced as some rendang can be but it's served puffy and piping hot with a wonderfully pungent fermented sambal as well as pickled radish to take the heat out of the sambal if you need it. The most popular dish coming out of the kitchen is undoubtedly the otak otak. Usually it's a light fish mousse wrapped in banana leaves in a smart little package. 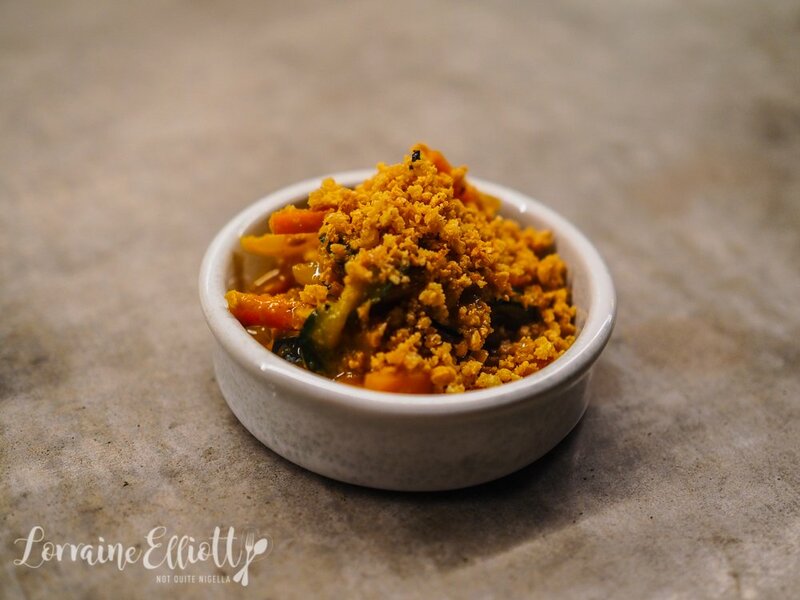 This version is a long and slender spanner crab stock and coconut milk parfait infused with curry paste then set with a seaweed extract. 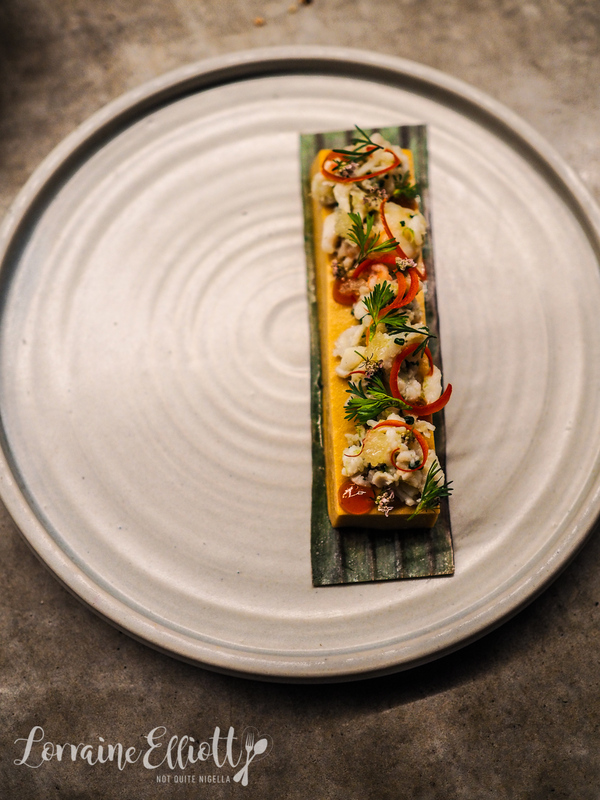 It is served resting on a charred banana leaf with picked spanner crab meat, chilli, finger lime, coriander and a nuoc cham (sweet fish sauce dressing) gel parfait and served with rounds of house made crispy rice crisps which you spoon it on. I dare anyone to stop at one rice crisp of this. The curried spanner crab mousse spreads lightly and creamy with the crunchy crisps. Although I think that this is perhaps one dish too many for the two of us, I'm so glad that we ordered the Fremantle octopus. It is exquisitely pretty and come cut into bite sized, tender pieces on top of a bush tomato and lemongrass sambal with slices of onion. 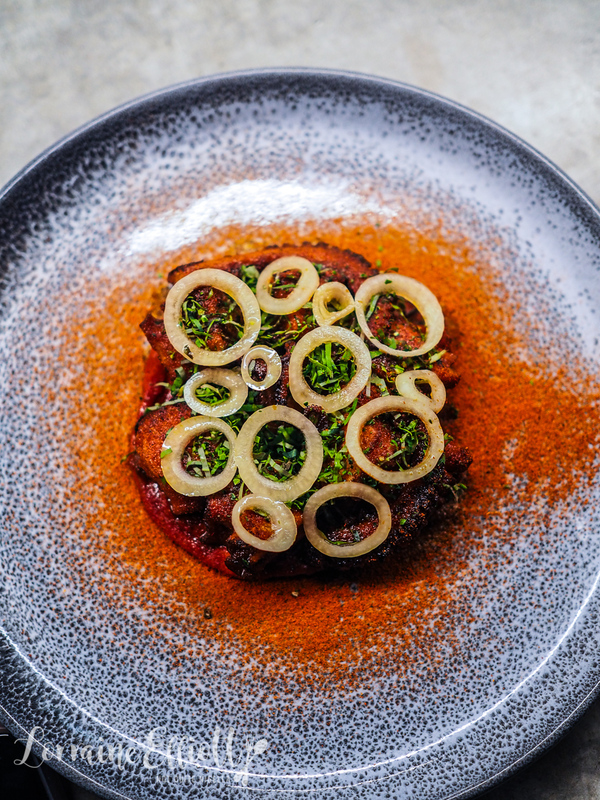 The creamy sambal is made with lemongrass, shallot, tomato and garlic then is cooked down until caramelised and blended until smooth and seasoned with kombu stock and sherry vinegar. The sauce is spicy and addictive while the octopus melts in the mouth. We are often the girls with eyes bigger than our stomachs. This lamb rump curry is a version of a dish that Khanh's mother used to make. When the lamb arrives it's a generous portion. 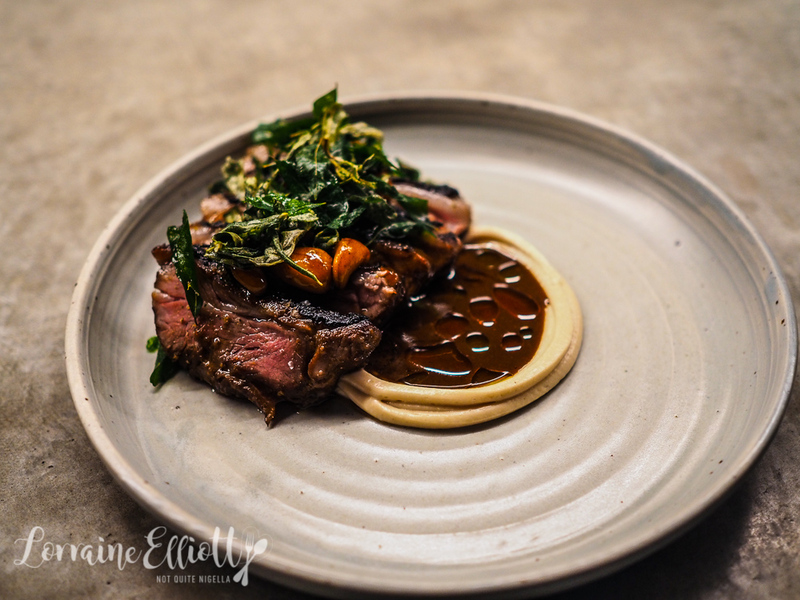 There are slices of melting, fat ringed lamb rump enriched with curry paste and Vegemite with cashews, saltbush and a native curry. The native curry is made with the usual curry spices with the addition of native spices like lemon myrtle, aniseed myrtle and native pepperberry. The cashew nuts have been braised for hours in Indonesian palm sugar and crispy fried saltbush seasoned with vinegar. One of Sofia's favourite dishes was the egg noodles with XO sauce and chicken cracking. I immediately gravitated towards it too because when it's freezing cold I go for comfort foods like breads, noodles and pasta. And this is a beauty. 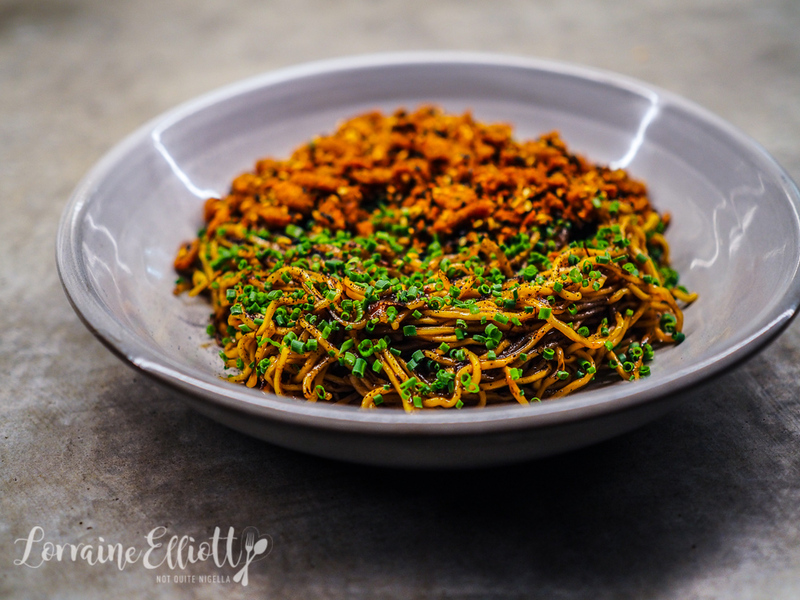 With a good char from the wok the egg noodles are cooked with XO sauce and native pepperberry as well as a sprinkling of crunchy pieces of chicken crackling. It's sizeable too and the sort of dish you find yourself going back to, even after you think you've eaten enough. And then comes dessert and a must order is the Bika Ambon. It's an Indonesian cake with a delightfully spongy texture. Khanh describes it as "It's a cake I first experienced during a trip to Medan, Indonesia. I was fascinated by the little air pockets and strands that were layered through the cake and decided I wanted to put it on the menu at Sunda." The process is long and the cake is an infusion of coconut milk and cream, kaffir lime leaf, lemongrass and dark palm sugar. It is then left to ferment and sour with yeast for four before being poured into a cake tin and cooked for two hours. 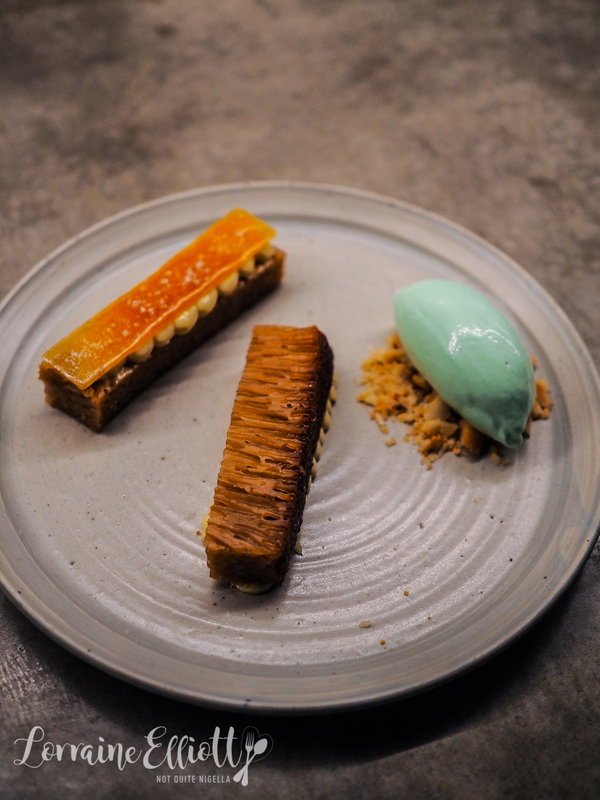 Khanh serves it with banana custard, macadamia and pandan ice cream as an ode to banana bread. It's like a puffy crumpet banana cake in a cake form. The banana custard, roasted macadamias, pandan ice cream all go wonderfully with this soft, warm and spongey cake. And because it's the end of truffle season, we also try the Vietnaese coffee dessert. It's Khanh's take on Vietnamese coffee ice cream which he drank every day during his research trip. 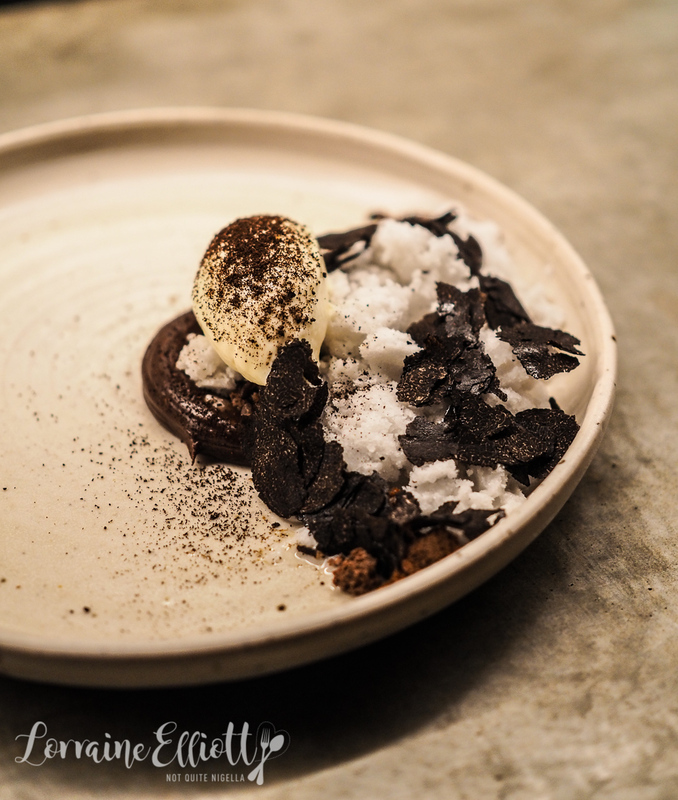 It starts with chocolate coffee mousse, dehydrated wattleseed cake, puffed wild rice, cocoa nibs, coffee honeycomb, young coconut granita and a condensed milk ice cream with Vietnamese coffee dust and what else but shavings of lush truffle. I only wish there was something like this in Sydney! So tell me Dear Reader, which dish did you like the sound of best? And when offered truffle as an option, do you take it up? travel6 Melbourne Places to Eat With Something For Everyone! 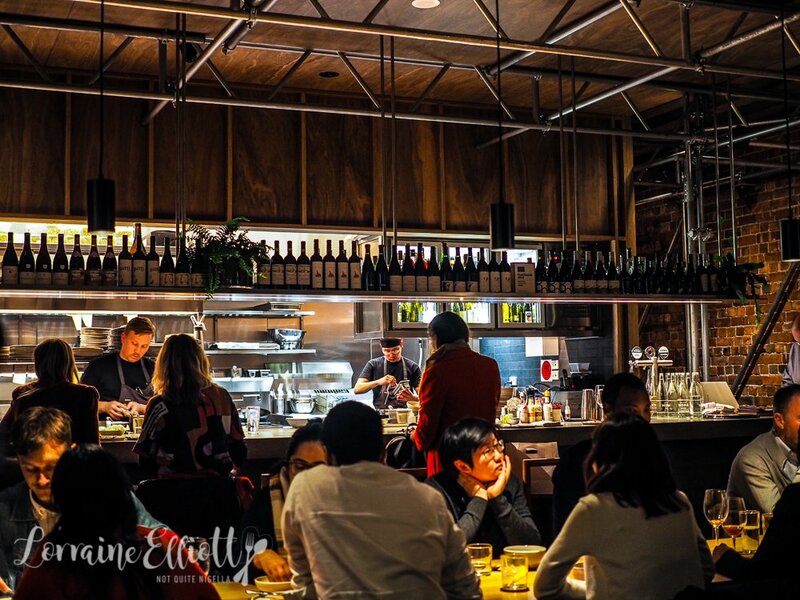 travel 6 Melbourne Places to Eat With Something For Everyone!